What do the moons of Pluto look like? Before a decade ago, only the largest moon Charon was known, but never imaged. 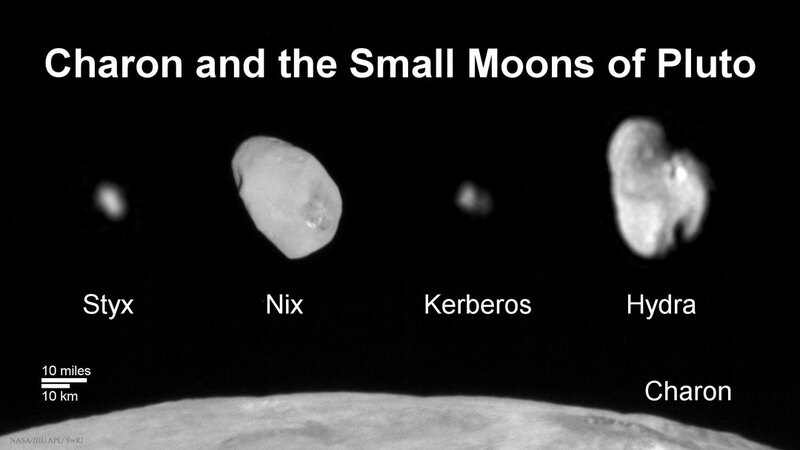 As the robotic New Horizons spacecraft was prepared and launched, other moons were identified on Hubble images but remained only specks of light. Finally, this past summer, New Horizons swept right past Pluto, photographed Pluto and Charonin detail, and took the best images of Styx, Nix, Kerberos, and Hydra that it could. The featured image composite shows the results — each moon is seen to have a distinct shape, while underlying complexity is only hinted. Even though not satisfyingly resolved, these images are likely to be the best available to humanity for some time. This is because the moons are too small and distant for contemporary Earth-based telescopes to resolve, and no new missions to the Pluto system are planned.